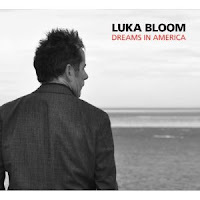 Luka Bloom’s songs, both in the writing and in the playing, seem a bit like impressionist paintings: structure created by vivid bits of language and color, a sense of place that weaves in and out of stories that are framed in place -- in Bloom’s case, that is mostly his native Ireland -- but not at limited to knowing that place to take in the light, the color, and the dark of it. Bloom’s latest album is a retrospective, of sorts. He revisits and records anew longtime favorites, both those he’s written himself and several he’s covered. There is also one piece he has not recorded before here, and that comes from the tradition: it is the ballad Lord Franklin. The album is called Dreams In America, and the title track is in some aspects a contemporary song of immigration and emigration, and on the separation from those we love that goes along with that, and the hope for good things that goes along with that sort of change as well. It makes for a fine opener to a set of songs that are introspective while still allowing the listener room to come in, poetic and filled with strong stories at the same time. Blackberry Time is a song of love and connection, and Ciara is a celebration of that, while Love Is a Place I Dream of takes a bit of a different view. The person the singer is speaking with in Don’t Be So Hard On Yourself is someone we have all known, or been, at some point along the way. Acoustic Motorbike is a view of the Irish countryside, among other things, that you will not soon forget. Following on the impressionist painting analogy, you may very well come away with different ideas on what these songs are doing, too. You won’t soon forget Bloom’s guitar style or his narrative one, either. Both are powerful, and distinctive, and lend themselves to lyrics which re both those things, and well one ones which are intricate and gentle. In this new recording of songs he’s done before, he brings new depth and differening colurs to the songs, in ways that are both subtle and strong. Bloom has been at playing and songwriting professionally since he was fourteen, when he first went on tour to open for his older brother Christy Moore. Since then he’s traveled, as most musicians do, and lived variously in Ireland, the United States, Holland, and back in Ireland, where he is currently based. Listening to this recording, on the one hand you come away with the impression that Ireland has never been far from Bloom’s thoughts, and on the other, that his native territory is also the country of the imagination.